On this little shelf above all my other shelves is where I keep my small manga collection (mostly Fruits Basket and Momote Lollipop!) and my Enid Blyton collection hardbacks that I bought all for £4 (ish) each in TK Max. :) There's also my Cat Royal series by Julia Golding hardbacks - I love them, they're amazing and the covers are awesome. These are the books that I don't have room for, but they're not books I enjoyed or they're books that I read when I was younger, and they're not young adult, so they live in messy piles in my cupboard. They're all still in perfect condition though, just like all my other books! So those are my bookshelves, and I'd just like to thank Kirsty for letting me share them with you all! :D Hope you like them! Your shelves are so beautiful. 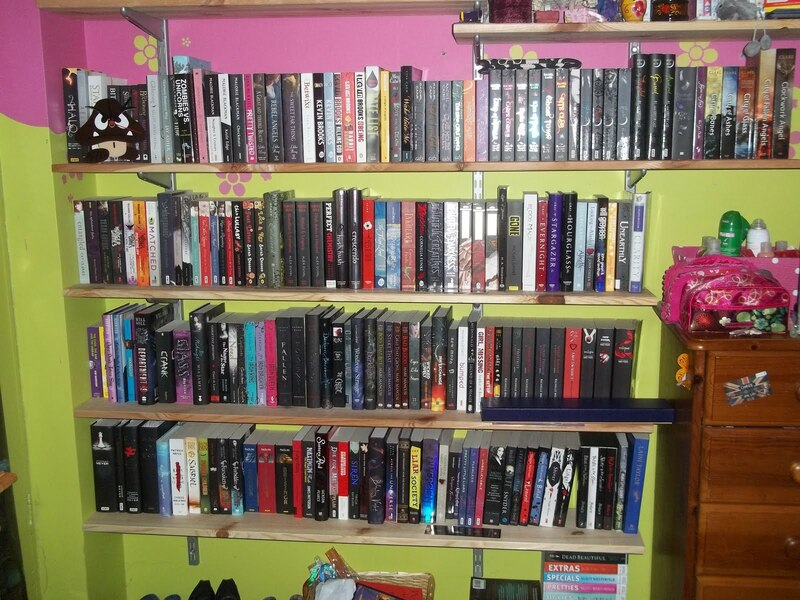 I could look at your YA shelf for ages! WOW! I want your bookshelf! How on earth do you have the effort to alphabetise your books? I used to work in a shop that shelved books in alphabetical order and it was such a pain in the arse to keep up :P Well done for that organisation. how do you keep your shelves in that order!? thats crazy!! lol... I love your walls, they are so cool! I have to ask though, I spy what I believe is a wand box but no Harry Potter!! Am I being blind? Your bookshelf is amazing, I could look at all your books for ages! Lots of books = happy times. You are organised to have them in order! So pretty. I can see some awesome books there too. Great reads on there too! Those are some very neat and organised looking shelves, I'm impressed!